In a smaller sauce pan, heat Soymilk until it begins to steam. Stir in the Sugar and Margarine and turn the heat down to a simmer. Once the Margarine is melted, remove from heat and cool to a lukewarm room temperature. In a large bowl, add your Sweetened Soymilk and stir in Yeast, Salt, Nutmeg and Flour. Stir in the Egg Replacer and Applesauce with a large spoon and then blend with a hand mixer for about 2 minutes. You want the Batter to be smooth. It's very sticky though, so watch your mixer. The Batter can creep right up into your mixer before you know it. Cover with foil and allow the Batter to chill in the fridge overnight. The next morning, gently knead the Batter on a heavily Floured surface and roll out with a Floured rolling pin. Cut into triangles and/or squares. We tried different sizes and types of triangles to see if one was better than the other and they were all equally just awesome. So I'll let you decide. Lay your cut-out, raw Beignets out on a piece of wax paper and cover with a fabric napkin/towel. Let them chill out and rise for another 30 minutes. Fill your dutch oven half way with Olive Oil. I know that seems like a lot, but you can get a big bottle of non-organic Olive Oil for $5, and we used half of one of those bottles for this recipe. Heat your Oil at a high temperature. You want it to bubble. Once it begins to bubble, start tossing the Beignets in one at time. Let them fry for about 30-45 seconds on each side, or until they turn a golden brown. Use a slotted spoon to remove them, and place them on a plate with a paper towel to soak up extra Oil. 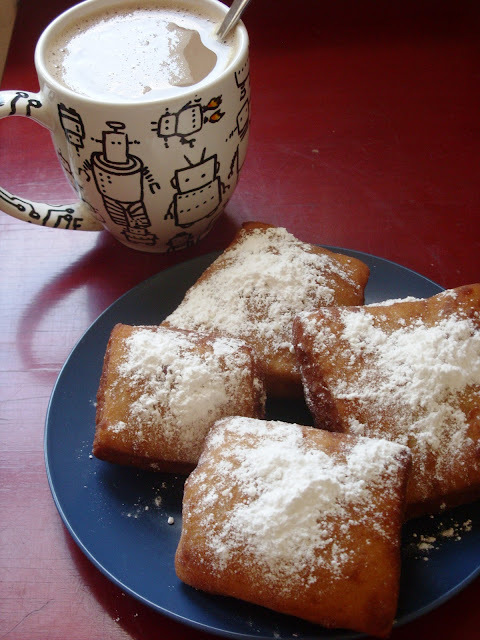 Once they are cool--but not cold--dump a ton of powdered sugar on them and laissez les bon temps roulet! PS - This is just the 1st post from our New Orleans Stay-cation. Check back tomorrow for more grand grub! You had mugs of coffee in your boxers? Sounds uncomfortable. LOL! Oh yum! My family goes to NOLA every year, and my mom always brings homemade vegan beignets for me to eat when we're at Cafe du Mode. My parents eat the ones there, but I have my special vegan ones.